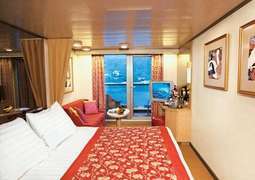 All passengers on board ms Zuiderdam are sure to find a perfect cabin for their ideal cruise experience. All cabins are bright and comfortably furnished, with a minimum of 16 m², providing more than enough room for a relaxing and restorative holiday. You can choose from Inside, Outside and Balcony cabins as well as Suites on board which can span up to a spacious 105 m² with incredible decor and comfort which comes with many special advantages. 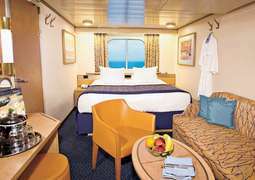 ms Zuiderdam has 26 wheelchair accessible cabins on board catering for everyone. With such a great and diverse selection of dining options, no one will go hungry aboard ms Zuiderdam. The 'Pinnacle Grill' offers excellent steak and seafood dishes or dine in at the 'Terrace Grill' with has an outdoor bistro style grill offering signature burgers, hot dogs, fries and more which is situated by the Lido pool. A continental menu can be found in the Vista Dining Room, as well as delicious vegetarian and low-carbohydrate dishes. The gourmet chefs on board are sure to impress you with their fine cuisine. There you also have the option of tasting a variety of specially selected wines. 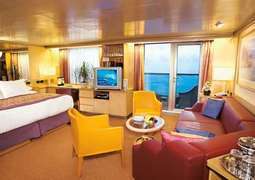 ms Zuiderdam offers entertainment programmes for all age groups. Watch master chefs show off their tricks at a gourmet cooking show and then sample the results. The Vista Show Lounge is home to a diverse evening programme, including singers, comedians, and magicians. Enjoy on the the latest movies on board at the cinema when movies 5 times a day. With an exceptional amount of different bars and lounges to choose while cruising the 'Piano Bar' offers a sophisticated atmosphere with classical music while 'Sports Bar' has an electric atmosphere and screenings of the latest games. A cruise with ms Zuiderdam is bound to be a wonderfully unforgettable experience. 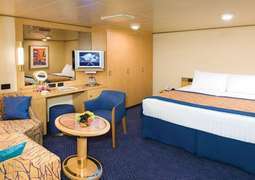 ms Zuiderdam has a great range of activities on board for the entire family. On board children and teens are invited to take part in activities in the 'Club HAL' or in 'The Loft'. Why not enjoy some family fun by the pool or even family fun packed activities like trivia, bingo and more. For adults there fun is also endless with wine tastings, mixology sessions, culinary arts and more. In the evening the older passengers can try there luck at the casino. Treat yourself with a visit to the Greenhouse Spa & Salon for face massages and wellness treatments to manicures and everything in between. The spa is a wonderful place to relax and let yourself be pampered. If your feeling active enjoy an evening at the fitness center equipped with the latest fitness equipment or give one of the numerous classes on offer a go! You can enjoy an morning jog on Deck 10 where you can soak in the view.